Mega Sale! Save 25% on the ViewHD HDMI Audio Extractor | Optical Toslink + L/R Stereo Analog Converter Outputs | Model: VHD-H2HSAs by ViewHD at The Met Theatre. MPN: FBA_VHD-H2HSAs. Hurry! Limited time offer. Offer valid only while supplies last. The ViewHD audio extractor supports Amazon FireTV, Roku, etc. Please make sure the AV receiver can support the specified audio formats to have sound. The ViewHD audio extractor supports Amazon FireTV, Roku, etc. Please make sure the AV receiver can support the specified audio formats to have sound. This ViewHD HDMI extractor has one HDMI input, one HDMI output, one SPDIF output and RCA L / R stereo audio output. 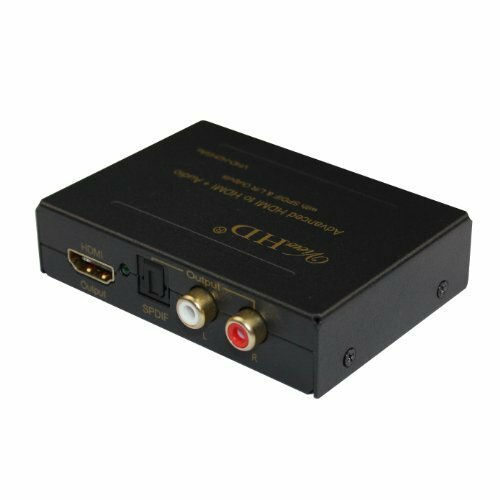 It can extract digital 2CH PCM stereo audio signal from the HDMI input and convert it to 2CH analog stereo output through its RCA style L/R analog output. The RCA L/R output will not have sound if the incoming audio is multi-channel audio (>2CH). Set EDID switch to 2CH for RCA L/T stereo application. The SPDIF optical audio output supports all audio formats up to 5.1CH Dolby Digital 5.1CH / AC3, DTS 5.1CH AND Dolby Digital Plus "DD+" formats. For DD+ audio application, it is EXTREMELY important to use high quality Toslink cable. TOSLINK optical audio output does not support higher formats, such as HD audio (Dolby TrueHD, DTS-HD Master Audio, PCM5.1 and beyond). The HDMI output has identical video and audio signals as the A/V signals coming into its HDMI input. Audio Extractor, Universal 100V - 240V Power Adapter with US plug & User Manual. Set audio EDID to 5.1CH for DD5.1CH / DTS5.1CH, use optical output to connect to audio receiver for surround sound. HDMI output supports all formats including PCM5.1CH and beyond. For 5.1CH PCM or above, set audio EDID to pass, connect HDMI output to receiver directly. If no video, do: 1) power up the TV, 2) power up this extractor, 3) Power reset the HDMI source unit.